����������� A quiet and tranquil province, Nan nestles in a verdant valley in northern Thailand. About 668 kilometres from Bangkok, it covers an area of 11,472 square kilometres and is made up of the following districts: Mueang, Wiang Sa, Na Noi, Pua, Chiang Klang, Tha Wang Pha, Thung Chang, Mae Charim, Ban Luang, Na Mun, Santi Suk, Bo Kluea, Chaloem Phra Kiat, Song Khwae, and Phu Phiang. The people of Nan descend from the Lan Changs (Laotians). Their forebears moved to settle around present-day Pua district which is rich in rock salt deposits, about 700 years ago at the time when Sukhothai was becoming the kingdom of the Thais. They subsequently moved south to the fertile Nan River basin which is much more extensive. From Bangkok, take Highway No. 32 to Nakhon Sawan and use Highway No. 117 to Phitsanulok, Highway No. 11 to Amphoe Den Chai, then take Highway No. 101 to Nan via Phrae, a total distance of 668 kilometres. Transport Co. Ltd. operates bus services from Bangkok's Mochit 2 Bus Terminal to Nan every day. Call 0 2936 2852-66 or visit www.transport.co.th for more information. Other private companies are such as Phrae Tour Tel: 0 2245 2369, Sombat Tour Tel: 0 2936 2495-6 and Choetchai Tour Tel: 0 5471 0362 (Nan Office). PB Air flies from Bangkok to Nan. Visit www.pbair.com for more information. Wat Nong Bua in Nong Bua village of Tha Wang Pha district was built by Thai Lue craftsmen who had early migrated from southern China. Apart from the Vihan which is adorned with elaborate carvings, there are also wall murals painted by Thai Lue artists some one hundred years ago. Their artistic value and degree of perfection equal those at Wat Phumin. To the north of Nan along Highway No. 1080 in Nong Bua district and with a further distance of 25 kilometres on the route to Bo Kluea district lies the Doi Phu Kha National Park. The terrain is mainly forested lands on limestone mountain ranges, the source of several streams which merge into the Nan River. The elevation is about 1,900 metres above sea level. Here are found several rare and near-extinct floras, particularly the Chomphu Phu Kha, whose pink flowers are in full bloom during February. In the morning, a sea of mist can be seen drifting across the valley. There are also several scenic waterfalls. Permits to camp can be applied for. Alternatively, tourists may choose to utilise the accommodation services in the park. A uniquely designed and the most interesting temple in Nan is Wat Phumin, which has a 4-portico, single building housing both the Ubosot and Vihan. Four Buddha statues with their backs against one another are installed in the main hall facing the four directions. The doors are delicately carved in splendid designs by Lanna craftsmen. Wat Phumin underwent a major restoration in 1867 since it was built some 27 years ago. It is believed that the wall murals were commissioned during this time. The wall paintings, in Thai Lu style are considered highly valuable and depict legends concerning the Lord Buddha as well as local legends and the local way of life, which include native attires, weaving and commerce with foreign countries. Wat Phra That Chae Haeng, about 2 kilometres from town on Highway No. 1168, is ancient religious site of the province. Once the centre of the old town, it was moved to its present location in about 1368. 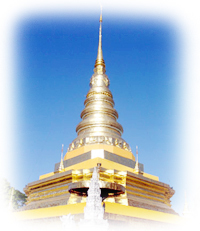 It features a 55 metre-high golden Chedi containing a Holy Relic from Sukhothai. Over the Vihan's door frames and on parts of the roofs are plaster designs in the shape of Naga, the great serpent, which represent the artistic best in local architecture. Wat Phrathat Chae Haeng is a sacred place of worship, situated on a mound on the eastern side of the Nan River, at the former centre of the Nan town after moving from Pua town. Wat Phra Borommathat Chae Haeng was constructed during the rule of Chao Phraya Kanmueang (the Feudal Lord of Nan during 1326 – 1359) as an enshrining venue of 7 Buddha relics, silver and golden votive tablets presented by King Maha Thammaracha Lithai on the occasion that Chao Phraya Kanmueang assisted in the construction of Wat Luang Aphai (Wat Pa Mamuang in Sukhothai Province at present) in 1354. It features a chedi in a bell shape. The pattern of Phrathat Chae Haeng is assumed to have been influenced by the chedi of Phrathat Hariphunchai. It is plated with Thong Changko or Thong Dok Buap – a combination of brass and copper. The staircase up to the Phrathat is in a Naga shape, while the gable above the entrance gate to the wihan is the stucco relief depicting intertwined Nagas, the unique characteristic of Nan fine art. Phra Borommathat Chae Haeng represents the Year of the Rabbit. Lanna people believe that travelling to pay respect to the Phrathat of their Year of Birth or “Chu That” would reap them great results. Tourists can visit the temple everyday from 6.00 a.m. – 6.00 p.m.
To get there: Wat Phrathat Chae Haeng is located in Muang Tuet sub-district, King Amphoe Phu Phiang. From the centre of Mueang district, cross the Nan River Bridge and go along the Nan – Mae Charim route or on Highway No. 1168 for 3 kilometres. Contact the temple at Tel. 0 5475 1846. The building of the Nan National Museum was actually constructed in 1903 and once the residence of a ruler of Nan. It displays exhibitions concerning the town's history and major structures, evolution of arts in different ages, and numerous ancient objects, the most eminent of which is the Black Ivory. It also provides anthropological information on the northern indigenous people including the several minorities residing in Nan. The museum is open Wednesday-Sunday from nine in the morning until four o'clock in the afternoon. This exciting activity waits for tourists who like to shoot many rapids. Rafting can be accompanied by elephant riding. The suitable time for rafting is from September to February. Visitors can contact travel agencies in the town. White-water Rafting along the Middle Part of the Wa River The rapids are of level 3 to 5 difficulty with a length of 100 kilometres. It takes 3 days and 2 nights passing the Doi Phu Kha National Park and the Mae Charim National Park. White-water Rafting along the Lower Part of the Wa River It was originally a transporting route for teakwood, which was illegally cut from the forest in Mae Charim and Wiang Sa districts. The Wa River runs through the valleys. On both sides are high undulating mountains, and more than 22 rapids. The level of difficulty is at level 3 - 5 (level 3 is medium, level 4 is difficult, and level 5 is very difficult). The biggest and the most difficult one is Kaeng Luang. Some parts of the stream are sandy beach where a raft can be stopped, and it is suitable for swimming. Some parts are the location of elephant camps where visitors can take an elephant to Ban Hat Rai. The period when the tide is the highest is during August, while the lowest one is in April. The most suitable time for white-water rafting is from November to January. - Sailing route by inflatable rubber dinghy: It starts from Ban Nam Pu, Nam Phang sub-district, Mae Charim district, and ends at Ban Hat Rai, San Na Nong sub-district, Wiang Sa district, being a total distance of 19.2 kilometres or takes 4 hours. However, if visitors start in front of the Office of the National Park , the total distance will be only 15 kilometres. - Bamboo rafting route: It starts from Ban Nam Wa up to Ban Nam Pu for a distance of 4 kilometres or takes approximately 4 hours. Contact the Nan Pang Chang Company, Tel. 0 5478 1316, the River Raft Company, Tel. 0 5471 0940, 08 9835 1506, and the Inter Tour, Tel. 0 5471 0195 for information of the Wa River Tour and elephant riding. This temple is located just before reaching the town on Highway No. 101. An ancient religious site, it has rectangular Chedi bases on which Buddha states are placed around the Chedi structure. Combined artistic influences of Lanna, Lan Chang and native Nan can be detected. This village is about 40 kilometres to the north of the town on Highway No. 1080, with an additional 3 kilometres after the left turn into the village in Tha Wang Pha district. The Thai Lue people living at Ban Nong Bua are noted or producing the traditional tribal fabric, an art handed down from generation to generation. It has also been improved in the designs but still retaining the original patterns. The native woven materials have now become a highly popular buy among tourist. ไทลื้อ มีถิ่นฐานเดิมอยู่บริเวณชายแดนพื้นที่รอยต่อระหว่างสิบสองปันนาเชียงตุง ลาว และล้านนา อพยพเข้ามาในประเทศไทยหลายครั้ง ทั้งจากเหตุผลทางการดำรงชีพ การถูกกดขี่จากจีน และพม่า หรือหนีภัยสงครามช่วงเปลี่ยนแปลงการปกครองในจีน บ้างก็อพยพตามสายเครือญาติ และการค้าขาย วัฒนะธรรมไทลื้อกับไทยวนมีความคล้ายคลึงกันทั้งภาษา ศาสนา การแต่งกาย อาหาร งานหัตถกรรม โดยเฉพาะวิถีการผลิตแบบ "เอ็ดนาเมืองลุ่ม" หรือทำนาดำ เอกลักษ์ทางวัฒนธรรมของชาวไทลื้อคือ ผ้าทอลายน้ำไหลและลายลื้อ โดยใช้เทคนิควิธีที่เรียกว่า "เกา" หรือ "ล้วง"